Thanks to Phun for the heads up. ENTERTAINMENT WEEKLY: Episode 207 ended with Cyborg Superman (David Harewood) going to the Fortress of Solitude to retrieve something called Project Medusa. What is Medusa? BRENDA STRONG: Medusa plays very strongly in the next episode, which is episode 208, and it’s basically a virus. It’s one of those exclusive viruses that doesn’t touch anyone whose organic material is human. It only attacks anything that is alien, and it’s a big one. So, that poses imminent threat to the planet. Lena befriending and working with Supergirl is probably another blow to their relationship, right? Yeah, I think so because it’s a mirror of what happened with Superman and Lex. In 207, she basically says, “Superman destroyed my son, and I won’t let it happen to my daughter.” So, she’s very protective of Lena and her relationship, and when she saw the two of them together, I think it was probably was a blow to her. You know, we all interpret reality based on how we see things, and when two people are seeing things from two different perspectives, there’s innate conflict and that’s what makes great TV. So, I think that’s what you’re having here: two different missions and two different loyalties within the same construct. I’m one of six kids and not all of us see the world the same way, so that adds for interesting Thanksgivings. Speaking of which, we have a really fun episode coming up with a really fun Thanksgiving meal. 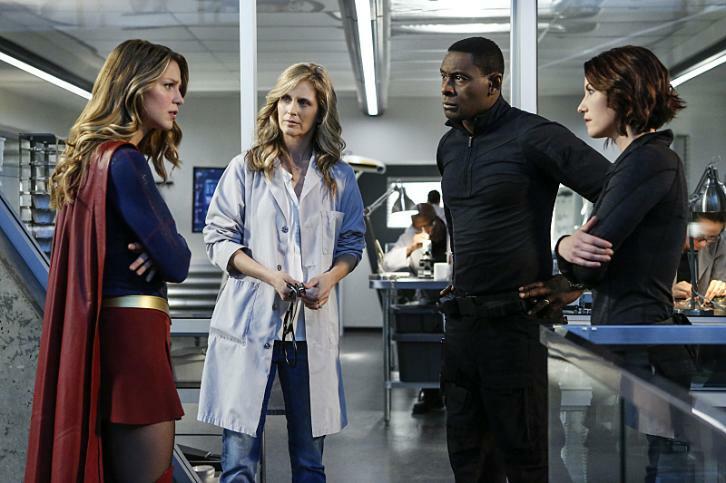 A NIGHT OF CONFESSIONS; THE EPIC SUPERHERO CROSSOVER KICKS OFF TONIGHT — Eliza (guest star Helen Slater) comes to town to celebrate Thanksgiving with her daughters. Alex (Chyler Leigh) decides it’s time to come out to her mother; Kara (Melisa Benoist) is shocked when Eliza suggests Mon-El (Chris Wood) has feelings for her, and Winn (Jeremy Jordan) and James (Mehcad Brooks) consider telling Kara the truth about the Guardian. Meanwhile, CADMUS unleashes a virus that instantly kills any alien in the vicinity so Kara enlists an unexpected ally – Lena Luthor (Katie McGrath). The epic superhero crossover kicks off tonight when Barry Allen (guest star Grant Gustin) and Cisco Ramon (guest star Carlos Valdes) seek Kara’s help with an alien invasion on their Earth. Stefan Pleszczynski directed the episode written by Jessica Queller & Derek Simon (#208). Original airdate 11/28/2016.